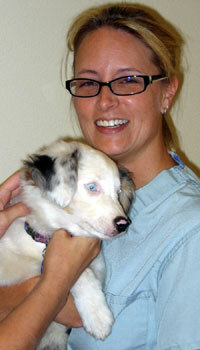 Dr. Moore holding her star patient. Megan says, "Whew, this getting better was a lot of work!" 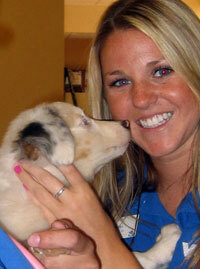 Megan gets some love and says, "Thanks for saving me!" Megan is home from undergoing treatment for a rattlesnake bite. Here is the story. 8/29/07 At 6:15 this morning Megan cried out in pain from under the deck. She crawled out screaming and would not stop. I heard a hissing from under the deck and guessed it was a rattlesnake, although I couldn't see anything under my deck...too dark. I took her to emergency in Sacramento (closest vet with antivenom) and her leg had swolen 4 times its size. She had 2 puncture wounds and was immediately admitted. I called Dave, our contractor who is at the Sanctuary every day and asked him to please pull up the deck boards to find the snake that bit Megan. Within 10 minutes he called me back to say he found a 2 foot rattlesnake and killed it. Snakes are a reality in the foothills but we are looking into solutions to try to keep them out of the Sanctuary. 8/29/07 4:30 PM - Megan's vet called to say her swelling had worsened and he recommended a second vile of antivemin. Naturally I said yes! One vile of antivenim costs $650. Two viles, $1300. Megan, priceless! 8/30/07 12:00 -Megan is chipper, but the swelling in her leg hasn't subsided. Dr. Moore wants to keep her one more night. I asked her to give vitamin C and other herbal remedies to help fight swelling as well as tissue damage. Her Vet was happy to oblige. Hopefully, I can take Megan home tomorrow, 8/31/07. 8/31/07 Megan comes home! Although she favors her leg, she's doing just great! I love this little girl! See video of Megan's homecoming - all the dogs came to greet Megan but she had more important matters on her mind. We depleted our Medical fund when we spent almost $1,300 on Samantha and Luke. So Megan's emergency came when we were already out of medical funds. I asked for a rescue discount for Megan, and VCA Animal Hospital gave us 10% so our bill was $2,400. Thank you VCA Hospital! Now we desperately need your help. To date, we've raised $400 towards her bill. We are so grateful for your support. We received many small donations that really added up. You all make a huge difference. Thank you very, very much! Donate to keep our emergency medical fund ready! We never know what's going to come up next. Megan is a darling 11 week old blue merle with her tail...she is pure joy. 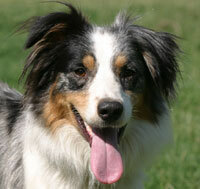 She is totally deaf, but you'd never know it till you see her sleep through 16 barking Aussies! Megan and her 5 siblings were found on the side of the road near Marysville. Her mama was hit by a car and came in late that night...she didn't make it. 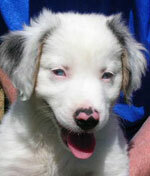 All the puppies have found homes, but due to her special needs, her care giver asked us to find her the perfect home. Megan was house raised, is very friendly towards all people and dogs and extremely trainable.